During this time the use of the Dracaena cantleyi plant for self-medication by orangutans has only been observed on seven occasions. But, the team were fortunate to capture this rare behaviour on camera. In the video, a female orangutan, called 'Indy', can be seen chewing the leaves to produce a white soapy lather. This lather was then rubbed onto the upper left arm for approximately 7 minutes and the leaves were never swallowed. 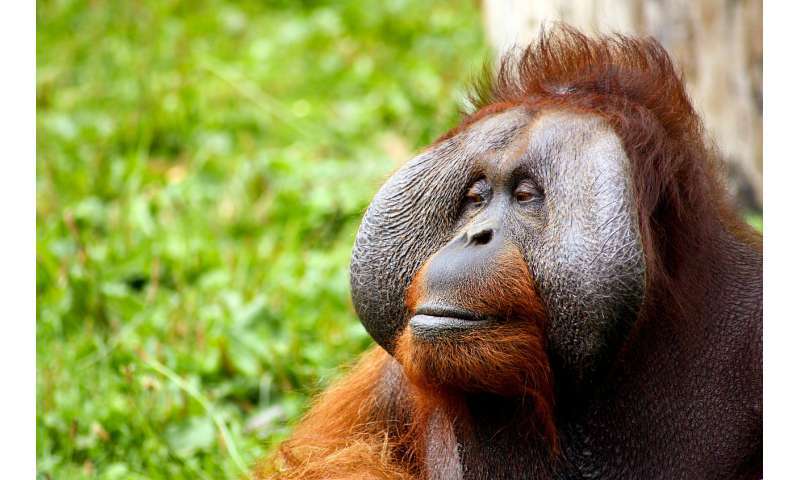 "For the first time ever, self-medication activities of orangutans has been confirmed through this research," said Dr. Ivona Foitová, of Masaryk University in Brno Czech Republic and Gadjah Mada University of Yogyakarta Indonesia, and co-author of a recent Scientific Reports paper reporting this discovery. "Pharmacological laboratory analyses revealed and proved leaf extracts of Dracaena cantleyi, which wild orangutans have been observed rubbing on their bodies, to have anti-inflammatory properties." Dr. Helen Morrogh-Bernard, Co-Director of Borneo Nature Foundation and lead author of the Scientific Reports paper, said "This is very exciting news as it confirms self-medication in orangutans, the first report of self-medication in an Asian ape, and for the first time, to our knowledge, the external application of an anti-inflammatory agent in animals." "In the Sabangau Forest, it has been primarily adult female orangutans observed performing this behaviour. We believe that females may be using this plant to soothe sore muscles and joints from the extra weight of carrying their infants while climbing through the forest canopy." The research team added "This new finding highlights the importance of tropical forests for medicinal plants, but more research into the practical uses of plants is needed. "It also opens up the question as to what other plants orangutans may use for medicinal purposes, a topic we know very little about."